Long ago, when I was studying at Europe, my South Korean classmate asked me whether I have foundation primer or not. I gave her my RMK “primer”, probably “Creamy Polished ”, she told me “…Primer, I said. Not foundation”. What she was looking for was “color control”. Actually there are some brands has “color control” and “foundation primer”, or “color controlling primer”. And those days as I remember the “color control” were rarely have sunscreen effect. My current biggest demand is not color controlling, but sunscreen, I often use sunscreens as a primer. While obsession for your order, we got some samples of “color controlling primer”, THREE Angelic Complexion Primer, it is not only color controlling, but also sunscreen effect of SPF22／PA+++. Not pretty much enough to single use. 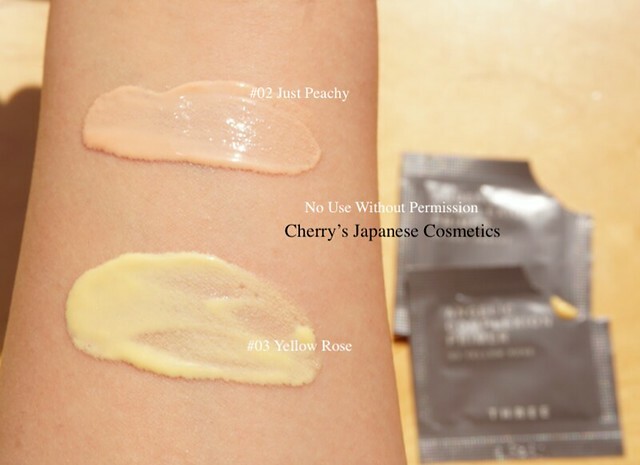 Please do not ask us if you want to see other shades, we are not sure whether they are producing samples for other shades (And please also do not beg us to send samples without order of THREE, they are all of what we have now). Anyway, here you are. On the BC of THREE did makeup me, the order of sunscreen, these color controlling of Angelic Complexion Primer, Foundation (Angelic Serum), concealers & Smoothing Wand, and powder. Oh. 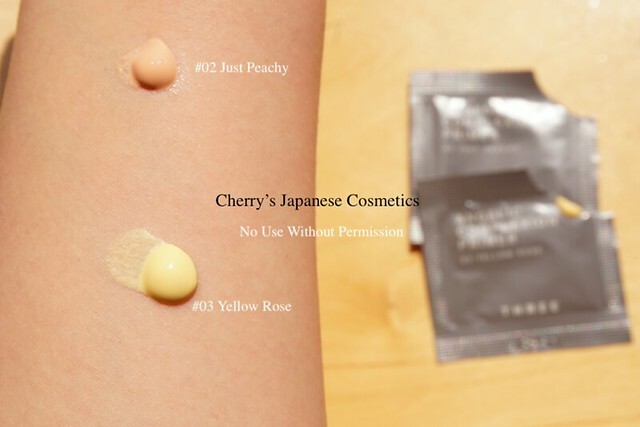 In this picture, there are simply naked arm with THREE Angelic Complexion Primer. Let me show you more easy to see. The texture is super runny. In this time, I used my fingers to spread, but I thought I should better to use sponges. On my face, it is light texture, but unfortunately I did not feel the combination of this Angelic primer & foundation is not good lasting for me, as I had mentioned on the article for Angelic Serum Foundation. Of course there are neither perfume, nor irritation on my skin. Let me blend on arm (the primer only). #02 Just Peachy is the shade what the BC chose for me. It looks my skin more good complexion and looks healthy. #03 lets me look more pale. They are “for me” in person. Let me blend with THREE Angelic Synthesis Foundation Serum. It is difficult to see the difference between these two shades, but #03 is not one torn, but almost half torn lighter than #02 side. The combination of Angelic primer & foundation is sheer, and the finish is naturally glow. The covering is sheer to medium. I had thought when you bought sheer foundations a little bit darker than your “preference”, try to use color controlling primers what makes you look pale 😀 And if what you bought is a little bit darker, try to use primers what makes you look more “healthy”. It was an interesting discovery for me. 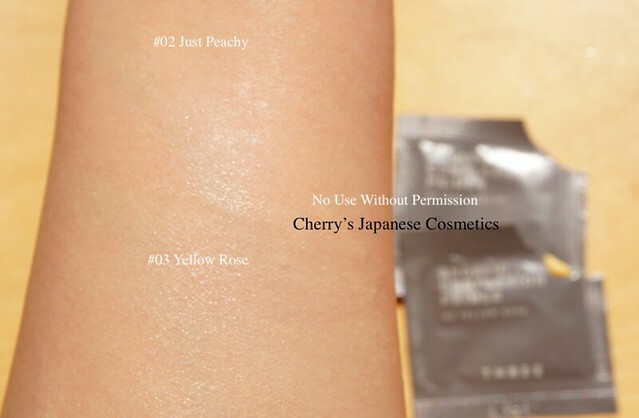 Totally to say, it is no perfume, no sting, weak sunscreen effect, and light texture product. If you are looking for something color controlling products, it can be for you.